286 Marlborough is located on the south side of Marlborough, between Fairfield and Gloucester, with 284 Marlborough to the east and 288 Marlborough to the west. 286 Marlborough was designed by Ware and Van Brunt, architects, and built in 1872 for builder and contractor George Martin Gibson, for speculative sale, one of five contiguous houses (284-286-288-290-292 Marlborough) designed as a symmetrical composition: 284 and 292 Marlborough are mirror images of each other, each with a turreted bay; they flank 286-288-290 Marlborough, which have stepped (curvilinear) Dutch-style gables. At about the same time, Ware and Van Brunt also designed three additional houses for George Gibson, 282 Marlborough and 7-9 Fairfield. George Gibson and his wife, Frances Rebecca (Esten) Gibson, lived in the Longwood district of Brookline and then in Medford. 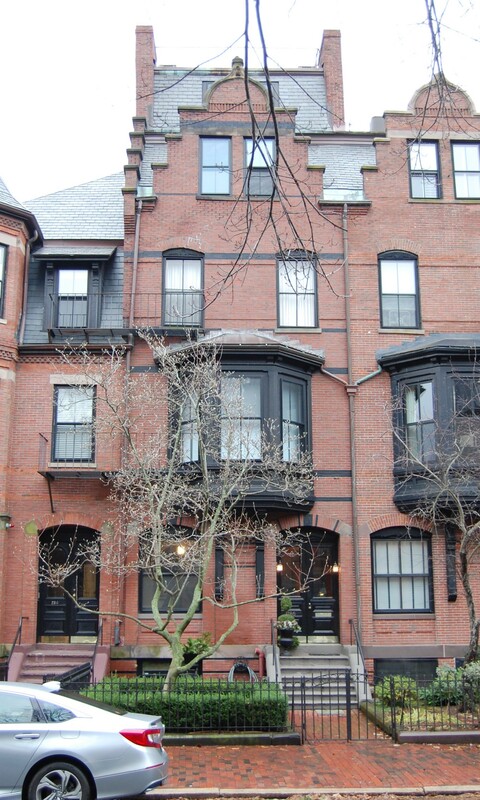 Click here for an index to the deeds for 286 Marlborough. On October 1, 1872, 286 Marlborough was purchased from George Gibson by George N. Macy, a banker. He and his wife, Mary (Hayden) Macy, lived at 100 Charles. On April 1, 1874, 286 Marlborough was acquired from George Macy by tobacco and merchandise broker William C. Waters. He and his wife, Susan L. (Whittredge) Waters, made it their home. They previously had lived at 345 Marlborough. They continued to live at 286 Marlborough during the 1879-1880 winter season, after which they moved to Salem. The house was not listed in the 1881 and 1882 Blue Books. On November 11, 1881, 286 Marlborough was purchased from William Waters by Charles Card Smith. He and his wife, Georgiana (Whittemore) Smith, made it their home. They previously had lived at 18 Rutland Square. Charles Smith was Secretary of the Boston Gas Light Company. He retired in 1889, after which he was an author of genealogical and historical material. Charles and Georgiana Smith both died in March of 1918. Their only child, Walter Allen Smith, had died in 1882, unmarried, and 286 Marlborough was inherited by Georgiana (Whittemore) Smith’s unmarried nieces: Alice Pattillo Woodbury and Georgiana Smith Woodbury of Gloucester, the daughters of David Elwell Woodbury and Susan Mansfield (Whittemore) Woodbury, and Annie M. Dodd and Jean M. Dodd of Cambridge, the daughters of John Dodd and Sarah (Whittemore) Dodd. 286 Marlborough was not listed in the 1919 Blue Book. On October 31, 1919, 286 Marlborough was purchased from the Smiths’ heirs by Selma (Bowditch) Stone, the wife of Dr. James Savage Stone. They also maintained a home in South Framingham, which previously had been their primary residence. James Savage Stone was a surgeon and instructor at Harvard Medical School, and also maintained his offices at 286 Marlborough. He previously had maintained his offices at 234 Marlborough. By 1921, Dr. Thomas H. Lanman, a surgeon, also maintained his office at 286 Marlborough. He lived in Cambridge and later in Chestnut Hill. By 1923, they had been joined by Dr. Joe V. Meigs, also a surgeon. He lived in Brookline. The Stones continued to live at 286 Marlborough during the 1927-1928 winter season, after which they moved to their home in South Framingham. He moved his offices to 264 Beacon; Drs. Lanman and Meigs moved there with him. James Savage Stone died in September of 1929. 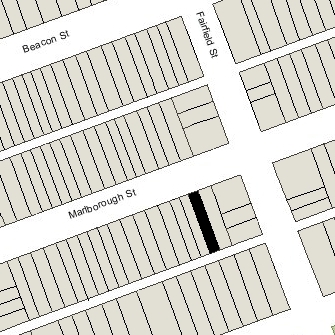 286 Marlborough was not listed in the 1929 and 1930 Blue Books, and was shown as vacant in the 1930 City Directory. On December 21, 1929, 286 Marlborough was purchased from Selma Stone by Dr. Robert Soutter. He and his wife, Helen Elizabeth (Whiteside) Soutter, made it their home. They previously had lived in Brookline and, before that (until about 1925), at 53 Hereford. He was an orthopedic surgeon and maintained his office at 253 Newbury. Dr. Soutter died in February of 1933. Helen Soutter continued to live at 286 Marlborough until her death in 1940. On November 10, 1941, 286 Marlborough was acquired from Robert Soutter’s estate by Mary F. Donlan, and on December 8, 1941, 286 Marlborough it was acquired from her by August Ochsner. He and his wife, Emma (Hermance) (Morlot) Ochsner, made it their home and operated it as a lodging house. They previously had lived in Gardner. Sometime after Robert Soutter purchased the house and before it was acquired by August Ochsner, a fifth floor was added to the building. The Building Department files do not include the permit for this addition, but do include a letter dated March 1, 1930, from Howard Turner, owner of 288 Marlborough, indicating his agreement with Dr. Soutter’s plans to “extend up” the party wall between their houses. The work may not have been done until the late 1930s or early 1940s, however, inasmuch as the house is still shown as four stories on both the 1937 Sanborn map and the 1938 Bromley map. The addition had been constructed, however, by 1942. The Ochsners continued to live at 286 Marlborough until about 1949. The property changed hands and on July 19, 1951, was acquired by real estate dealer Edward Swartz. It remained a lodging house until the mid-1970s. Edward Swartz died in May of 1972, and on August 10, 1978, 286 Marlborough was acquired from his estate by public relations executive Emanuel Goldberg and his wife, Paula (Masicov) Goldberg. 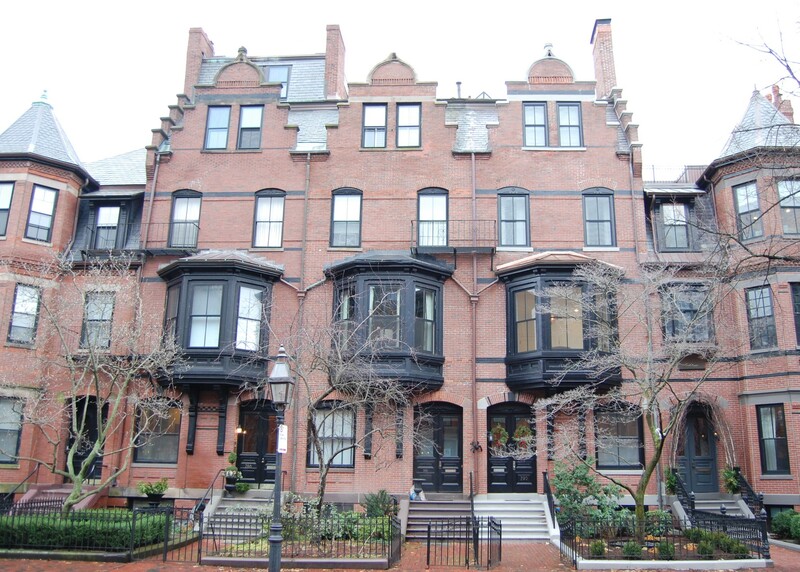 In July of 1984, the Goldbergs converted the property into four condominium units, the 286 Marlborough Condominium.